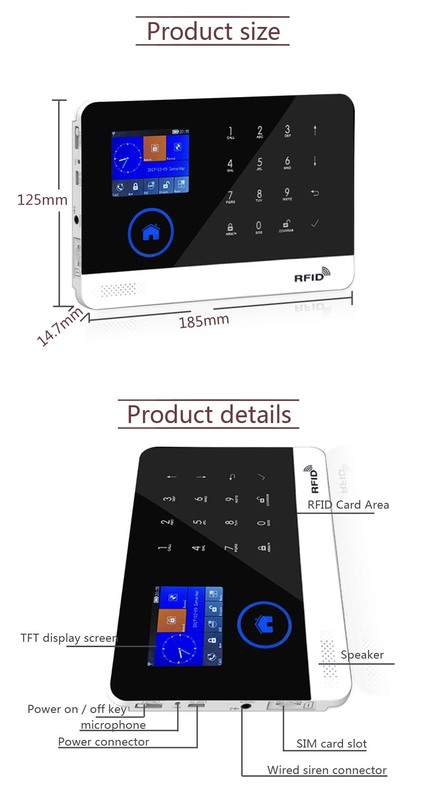 *2.4inch TFT display screen,concise user interface and menu hint disign. 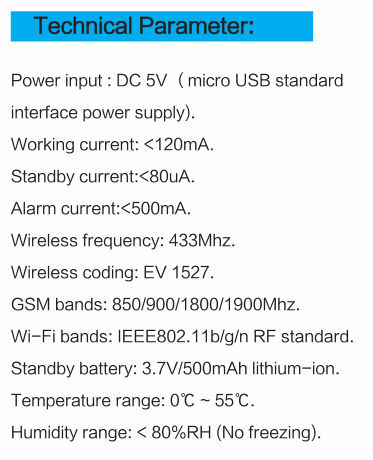 *Main interface status bar,date/clock indication,fairly obvious alarm host status. *Built-in powerful performance CPU master based on 32-bit Cortex-M3 core. 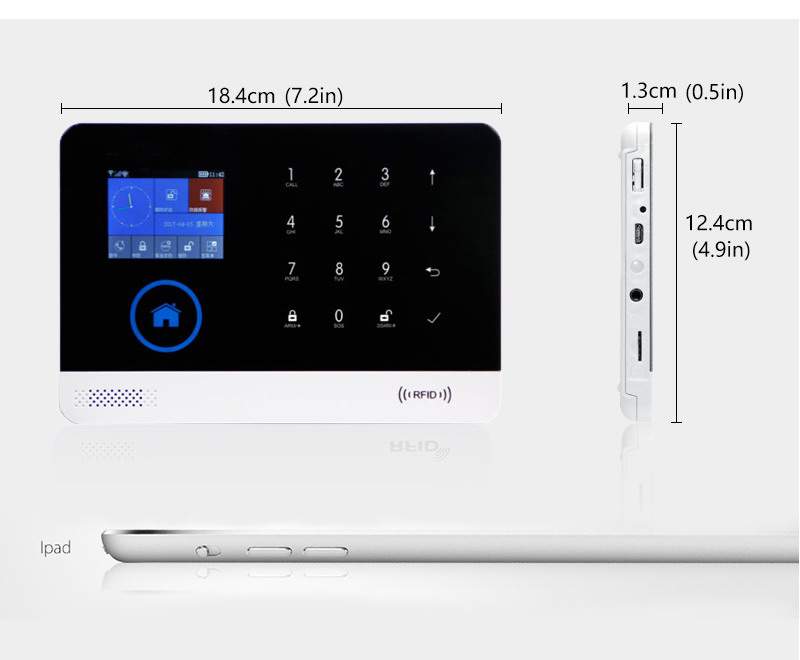 *Based on uCOS-III operating system.with multitasking design,great user operation exprience. 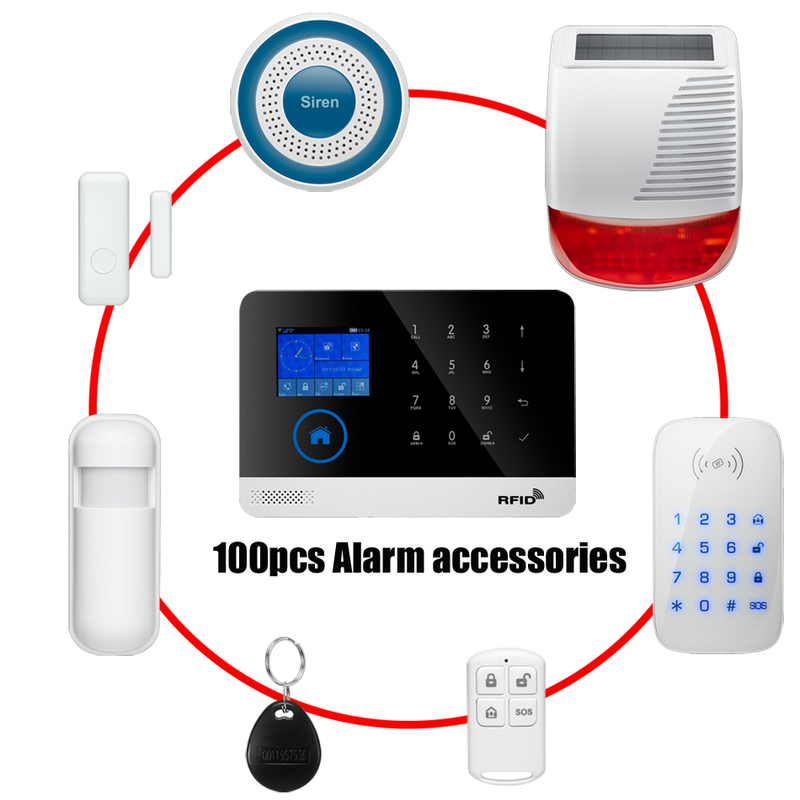 *WIFI/GSM//GPRS intranet alarm system,support different alarm channels.like APP push/SMS/voice monitoring/intranet center etc. 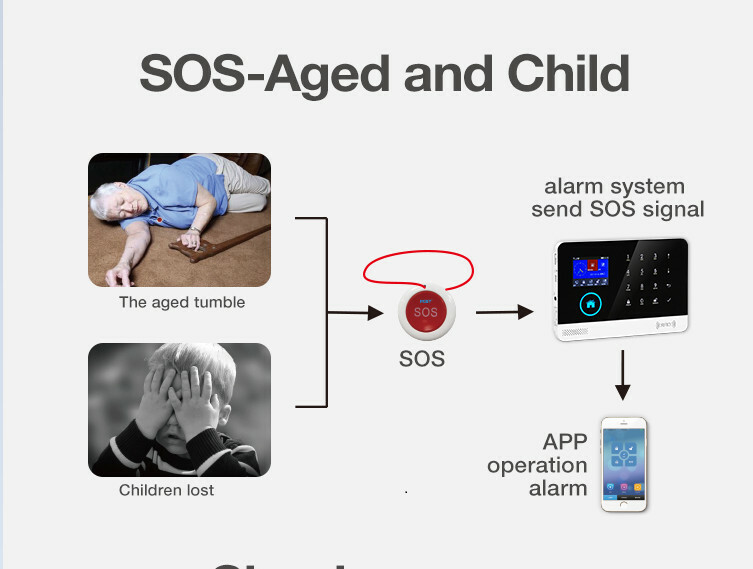 to ensure the alarm performance stable and reliable. *Support SMS arm/disarm and voice arm/disarm. 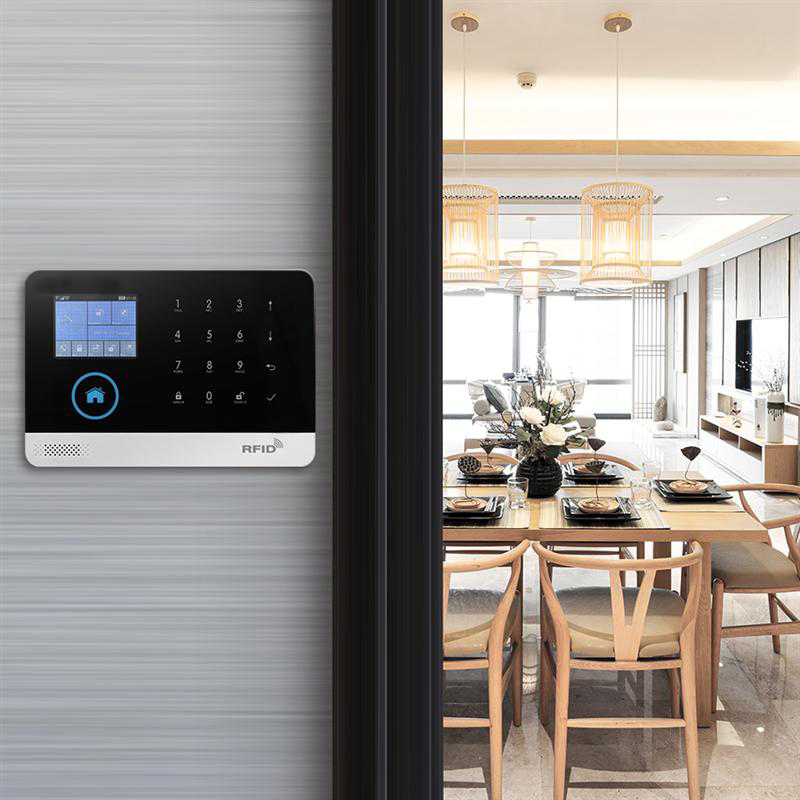 *Support up to 100 learning /storage location for remote control,RFID cards and wireless detector. *Support many defense zones ,such as gate ,SOS,bedroom,window,balcony,perimeter,smoke,gas,carbon monoxide,water leaking.etc. *Support the main power malfunciton ,backup power shortage,tamper alarm and other extended alarm. 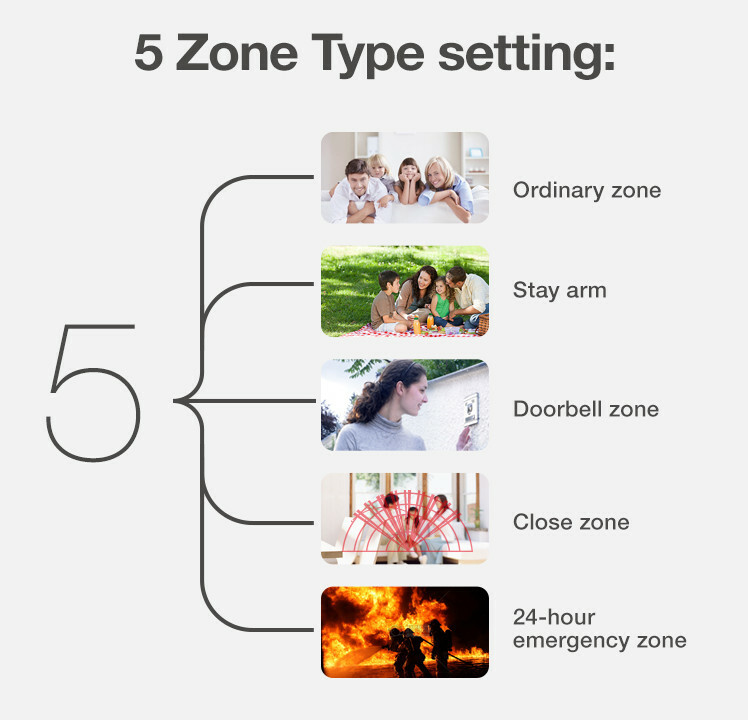 *Support entry/exit zone,indoor zone,perimeter zone,24-hour zone etc. 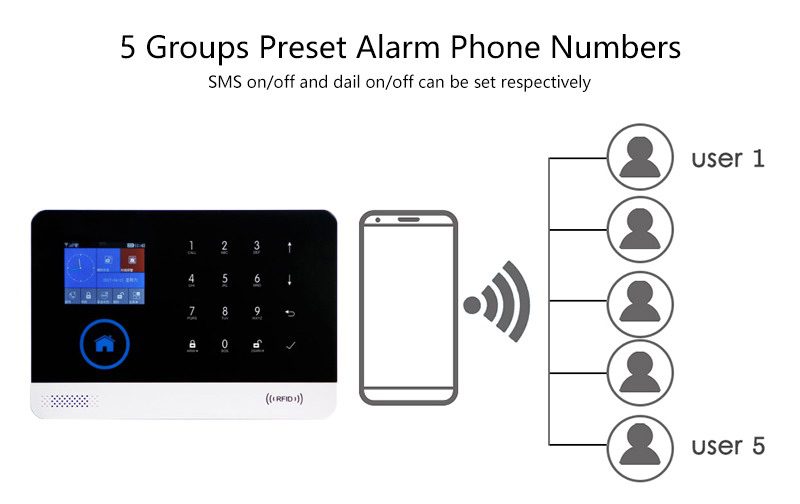 *Up to 5 groups preset alarm phone numbers ,SMS on/off and dial on/off can be set respectively. *Support timing arm and disarm. *Can store and inquire daily operation records and alarm records. 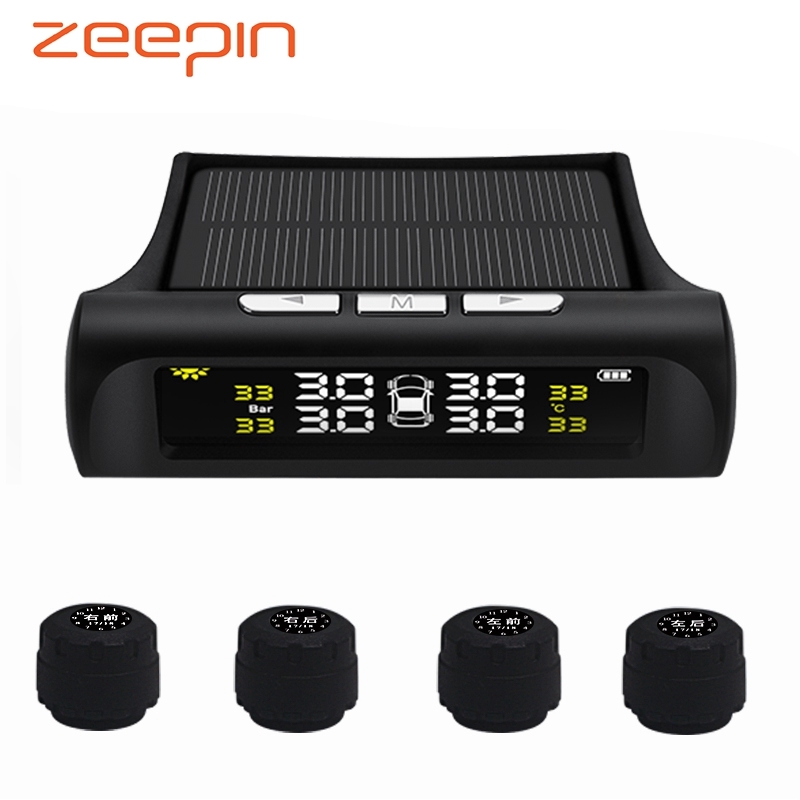 *GSM Network clock synchronization,to ensure accurate clock ,and support country time zone setting. 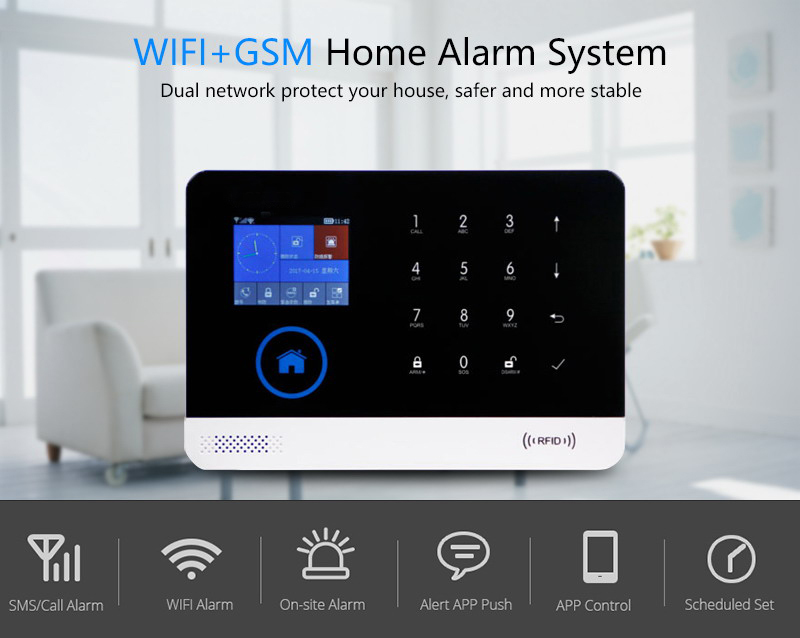 *Support multi-language menu display,voice prompts and alarm SMS setting. *Can record 20 seconds voice message and alarm voice. *Telephone function,support 5 groups re-dial number. *User-friendly APP operation experience and user interface. *Support APP remote arm/diarm,parameter setting and accessory management. 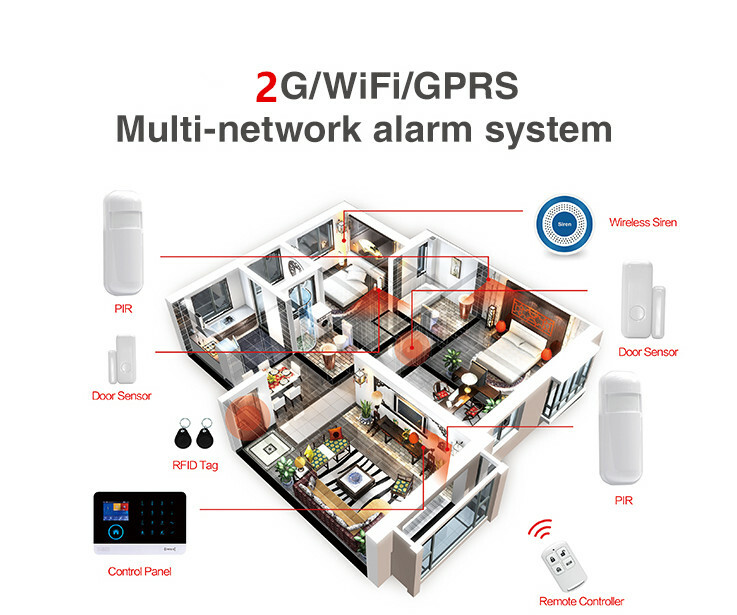 *Online GPRS to obtain equipment status,automatic alarm when offline. *Reserved remote GPRS TCP/UDP protocol channel ,compatible with multiple alarm center networking protocol to facilitate network alarm. 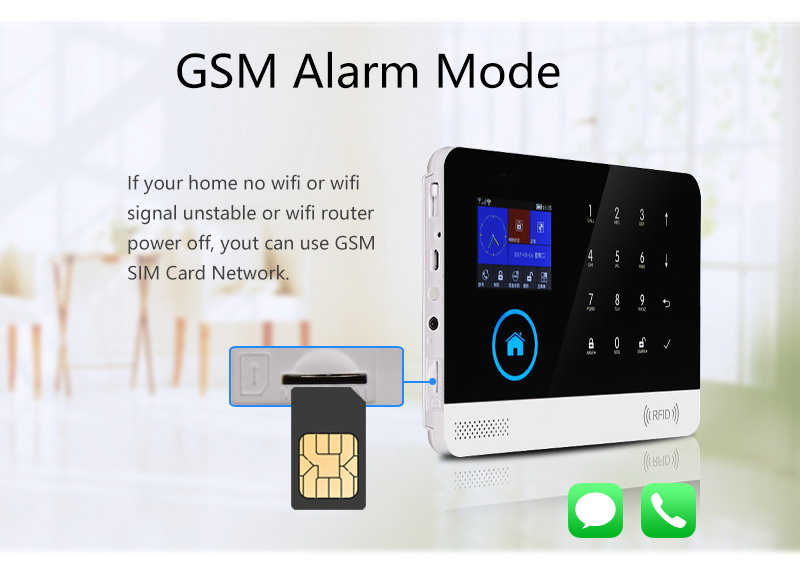 Note: this alarm panel only support 2g gsm sim card, no support 3g/4g sim card.